I love Toronto. I love curry. The two mix well. But one dish I find hard to source is Bombay Potatoes. So, I jumped in my bright orange 2-litre Ford Capri with go-fast spoiler and racing wheels and roared off (within the legal speed limit) on the hunt for Bombay Potatoes I could cook in the Brits in Toronto office kitchenette. I chanced upon Tasty Bites Bombay Potatoes so decided to give them a go. The packet was heavy. It had some substance, which indicated there was a fair-sized portion contained in the yellow packaging. Being a greedy bugger, that’s always a plus point. I just want to take a personal moment to thank Tasty Bite for their thoughtfulness. Not having a pair of scissors to hand, I was extremely relieved to see they had provided a handy notch cut out of the packet so it was easy to open. Thank you, Tasty Bite. Thinking ahead, I was reluctant to use the microwave to cook them in the one minute it claims in case it dried them out. So I opted for the boil-in-the bag option which only takes five minutes. Quick note: once you factor in the extra four minutes to get the water to a boil, and the 45 seconds to get them onto the plate, it actually takes around nine minutes and 45 seconds from start to finish. Taste test: very good! The sauce was thicker than expected — which was a pleasant surprise — and they were quite filling as a side dish. The actual pieces of potato were slightly smaller than expected, but still a good mouthful, especially when you combine the “potato to chickpea spoon ratio” as illustrated on the front of the packet. Spicy? As always … not quite enough. BUT that is a personal choice and not a criticism. They had some bite and I was reaching for the tissue a few times to blow my nose. The flavour was very nice, and will be on my shopping list again. We give Tasty Bites Bombay Potatoes a respectable Brits in Toronto 3/5 stars. 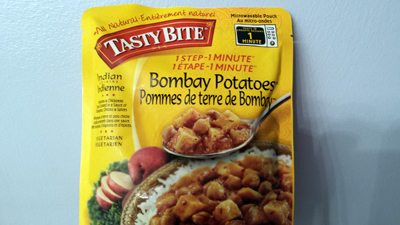 This entry was posted in Uncategorized and tagged brits in toronto, tasty bites bombay potatoes on April 30, 2014 by britsintoronto. The Brits in Toronto crew were a bit stumped for a snack the other day, so went wandering to Whole Foods. And what did we find? 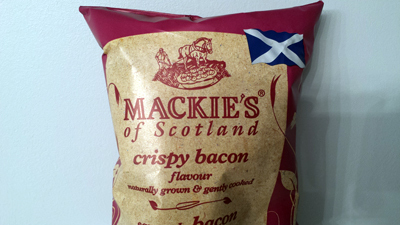 Scottish bacon-flavoured crisps! 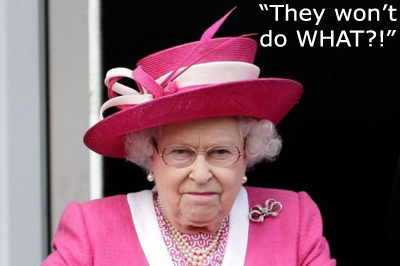 Hoots mon! First impressions were good. The bag had a good heft in our hand. Felt like it could hold its own in a bar fight with other bags of crisps. Good start. Upon popping open the bag, another plus point: only one fifth of the bag was pure air. We had actually paid for a decent amount of crisps, instead of the half-full bag you sometimes see from other brands. Lack of flavour. Noooo! We were expecting a more intense, smokey flavour of bacon, but it left us a bit wanting. Mackie’s = please up the bacon ante. We have to give them a Brits in Toronto 2/5 stars. Sidenote: We also have a bag of the Aberdeen Angus steak-flavoured crisps to sample so will review those soon too. This entry was posted in Uncategorized and tagged brits in toronto, mackie's crisps on April 27, 2014 by britsintoronto. So, what’s your point, Immigration Watch Canada? 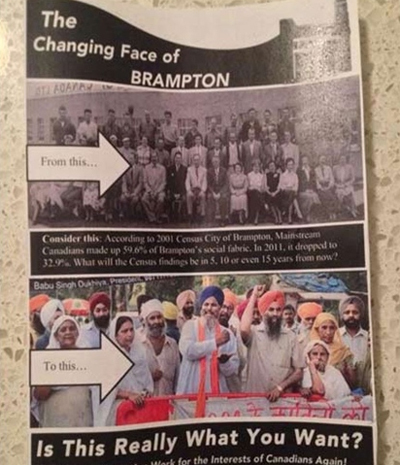 CTV News reported the story of anti-immigration flyers being distributed in Brampton by an organization called Immigration Watch Canada. So, any Canadians reading this: do you feel that immigrants are re-colonizing and ethnically cleansing your country? Would be interesting to hear the debate from both sides. Here’s a quick backgrounder from the Government of Canada entitled “Facts in Canada’s Immigration History” for ready reference. This entry was posted in Uncategorized and tagged brits in toronto, immigrants, immigration watch canada on April 27, 2014 by britsintoronto. 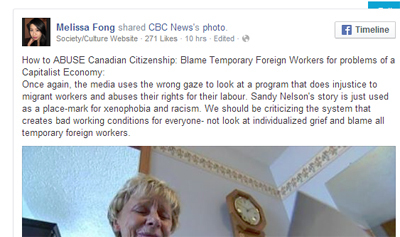 How to abuse Canadian Citizenship: Blame temporary foreign workers? That headline above caught our roving eye today; pretty strong words. Will be an interesting issue to watch. Thanks Melissa for the initial blog post that caught our attention. This entry was posted in Uncategorized and tagged brits in toronto, temporary foreign worker program on April 22, 2014 by britsintoronto. Time to change the system? 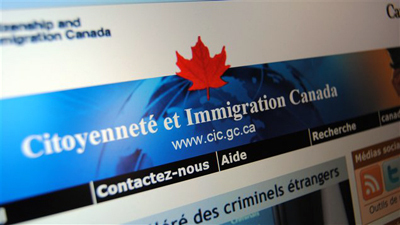 “Would-be immigrants to Canada continue to face a series of bureaucratic impediments that either delay their status or reduce the effectiveness of integration once they arrive here. Fixing these problems is long overdue. This entry was posted in Uncategorized and tagged brits in toronto, citizenship and immigration canada, immigration on April 21, 2014 by britsintoronto. 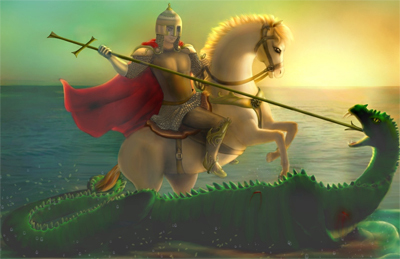 It’s St. George’s Day on Wednesday, April 23 and the English everywhere will be raising a pint to the homeland. It’s not widely celebrated like St. Paddy’s Day is in Toronto, so here’s a few events we tracked down if you want to go out and do something. Organized by the St. George’s Society of Toronto, this event features fish and chips, curried chicken and raffle prizes. Great-sounding event organized by fans of real ale. And it’s all for charity! Tickets. This event is organized by The Franklin House about 30 minutes away in Streetsville. Goes on all day. So, there you go. If you know of any more related events please add them to the comments section, e-mail or tweet us. This entry was posted in Uncategorized and tagged brits in toronto, st. george's day on April 20, 2014 by britsintoronto.